Great workers often develop early detectors of opportunities or dangers in their particular field. They are curious, gather information and try to anticipate what will happen. They then rehearse potential strategies for tackling challenges and achieving success. Such workers have an advantage over other people. 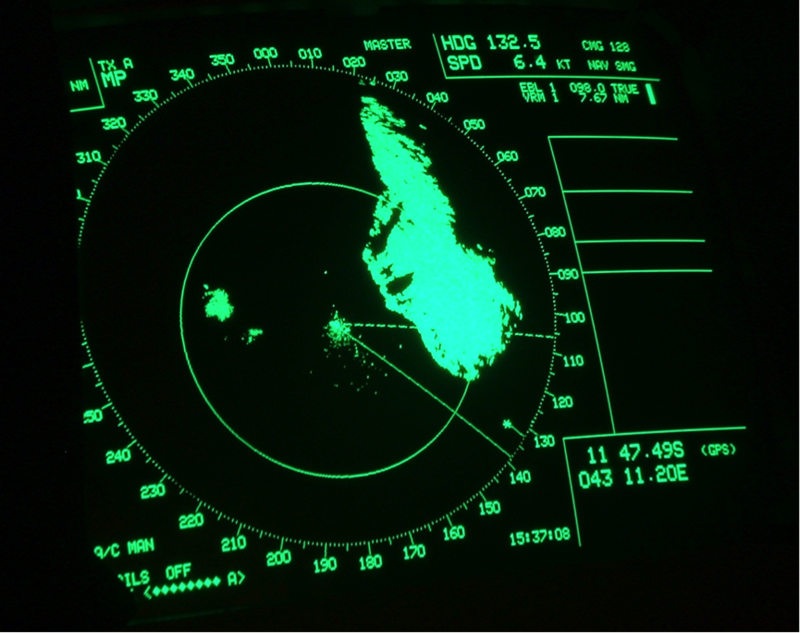 Al Siebert, who wrote The Survivor Personality, said such people develop what he called personal radar. They seem to know what will happen before it happen. I began to realize it wasn’t just luck or fate that these were the few who came back alive. Something about them as people had tipped the scales in their favour. Arie de Geus, the futurologist, said that such people develop a memory of the future. They constantly envisage what might happen in their chosen field. This means they are several steps ahead of other people when these situations occur. 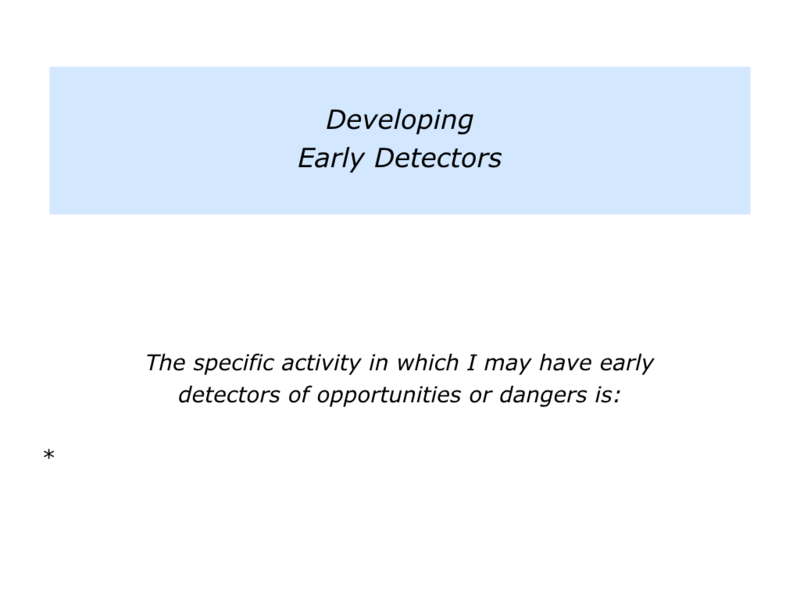 Is there any activity in which you have such early detectors? 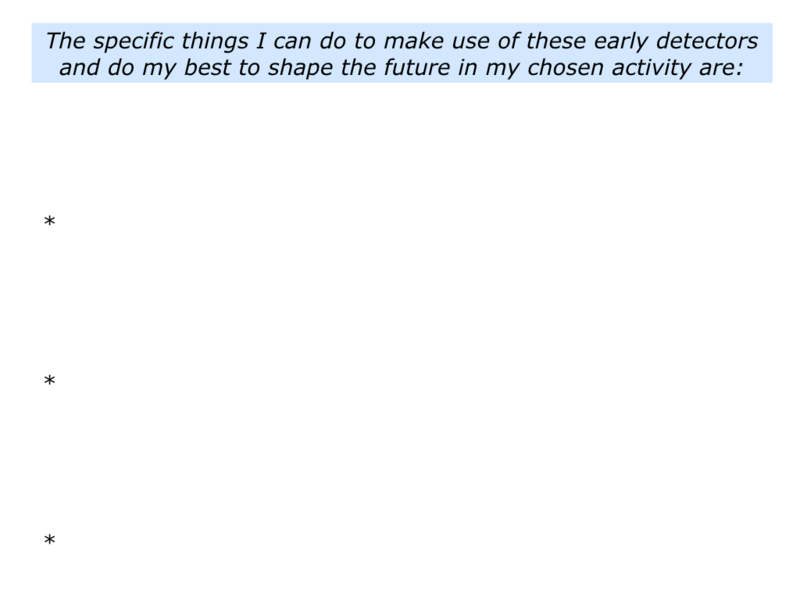 You may demonstrate this ability as a counsellor, educator, retailer, athlete, scientist, technologist or other work. 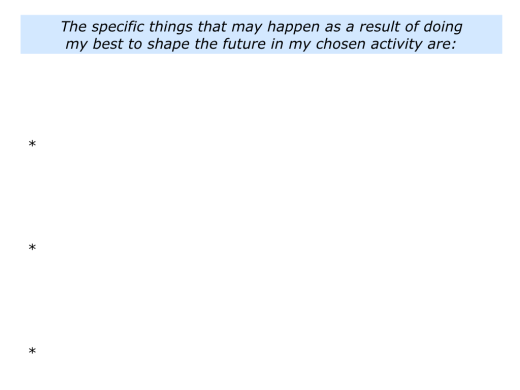 Alternatively, you may be good at anticipating events in your personal life. Looking at this activity, have there been any times when you have demonstrated this ability? You may have been able to foresee a particular event happening or predict a trend. Can you think of an example? 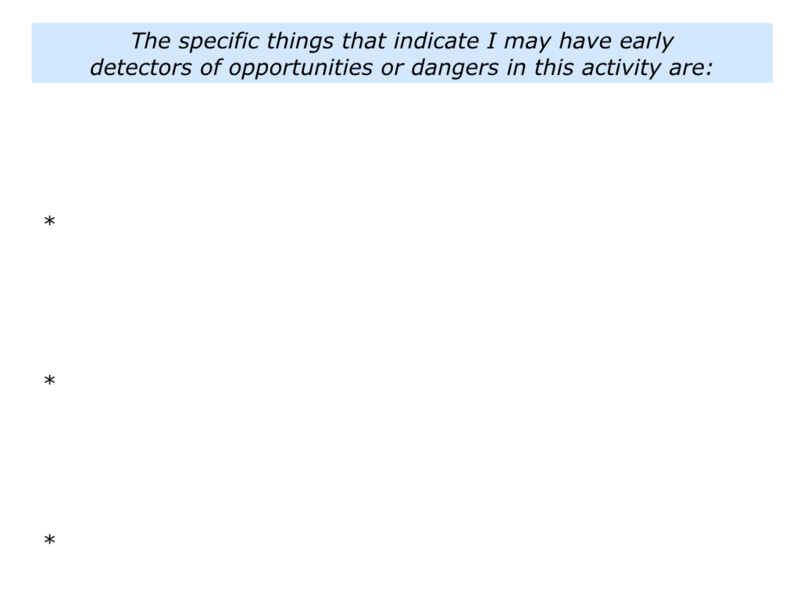 Describe the specific activity in which you may have early detectors of opportunities or dangers. 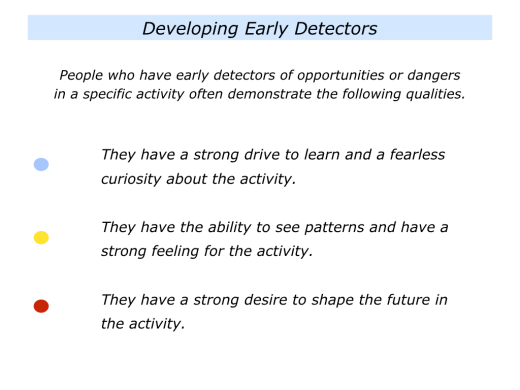 Describe the specific things that indicate you may have early detectors of opportunities or dangers in this activity. How do people develop such early detectors? Let’s explore several characteristics of such people. Such people throw themselves into learning about the activity. They love to devour ideas and make sense of the information. They sometimes enjoy the process of learning as much as lifting the prize. They have an obsessive need to master a skill. They keep practicing until they can forget. The information then becomes part of their system and can be applied to achieve success. If you want to become an actor, then don’t do it. If you need to become an actor, then do it. Great workers have a fearless curiosity about the activity. They want to seek more information, even if this sometimes throws them into confusion. They want to know the truth. Carl Rogers, the psychotherapist, believed that ‘the facts are friendly.’ He explained this in the following way. The facts are always friendly. Every bit of evidence one can acquire, in any area, leads one that much closer to what is true. He believed that people grew by facing reality. We should welcome information, said Carl, even if the new evidence shows that our previous views were mistaken. Whatever the revelation, the facts are friendly. Let’s move on the to the next theme explored by people who develop early detectors. Great workers have the ability to see patterns in their chosen field. Pattern recognition is one of the keys to peak performance. People who see patterns are able to get a strategic view of events and make better quality decisions. Where do you have this ability? You may see patterns when helping people to develop, coaching athletes, studying aspects of science, acting as a trusted advisor to customers or whatever. Sometimes this leads to developing strategic intuition and being able to predict the future. This is illustrated in the frequently told story about Wayne Gretzky, the ice hockey player. When asked how he managed to score so many goals, he gave answers that can be summarised in the following way. I skate to the part of the rink where the puck will appear. Great workers who see patterns often have a strong feeling for the activity and are good at it. One retailer I worked with explained their feeling for the business in the following way. Retail is in my blood. Put me in any shop anywhere and I will boost sales. I can immediately see how to display the products and lay out the store to improve profits. This goes back to my childhood. I loved going into town with my mother on Saturday mornings. In my minds eye I still have pictures of how the fishmonger, butcher and grocer laid out their shops. Even then I wanted to rearrange how they displayed the goods. I had difficulty at school. My parents saw I was good at selling, however, and encouraged me to get a Saturday job. That eventually paid for my first moped and gave me a degree of independence. This sounds odd, but sometimes I can literally smell how to improve sales. Many of these ideas have proved successful and helped to build the business. Great workers often care deeply about their craft. 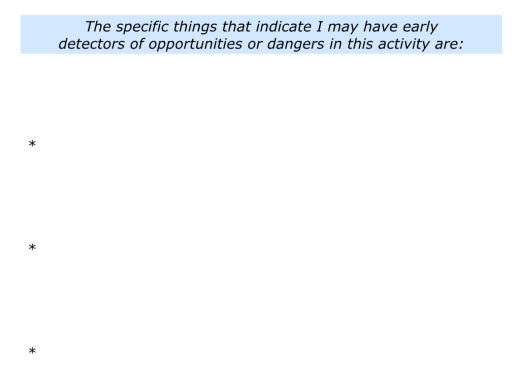 Because they have early detectors of both opportunities and dangers, they sometimes get impatient with other people. They often experience the following sentiments. I wish people could see what is happening. The following things – a, b and c – are happening now and could lead to the following things – d and e – happening in the future. We need to get a move on now, because otherwise there will be missed opportunities or big problems. Such workers can get frustrated or even depressed. Emerging from such clouds, however, they aim to shape the future in their chosen activity. To clarify the organisation’s picture of success. To clarify the potential options they can pursue – together with the consequences of each option – to work towards achieving the picture of success. To clarify how they can pursue their chosen strategy and do their best to achieve the picture of success. Great workers aim to build on what they can control and manage what they can’t. 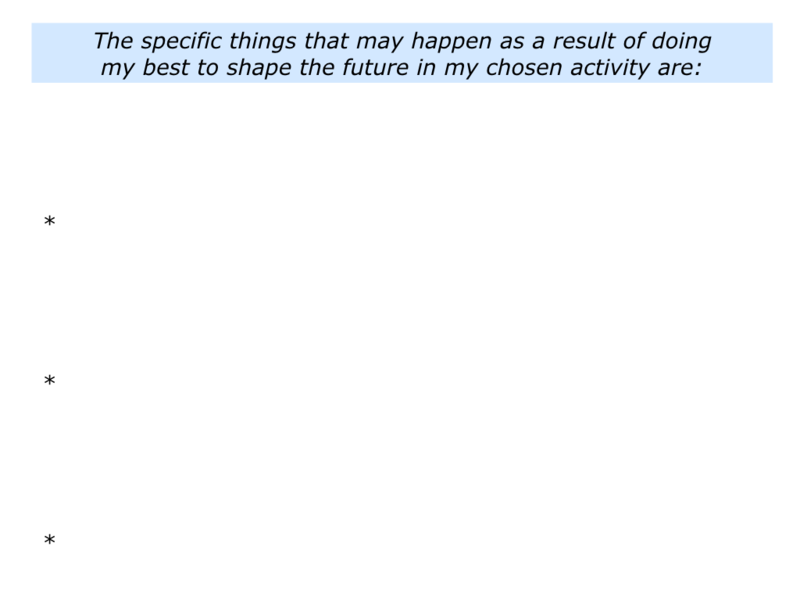 They then do their best to shape their future in their chosen activity. 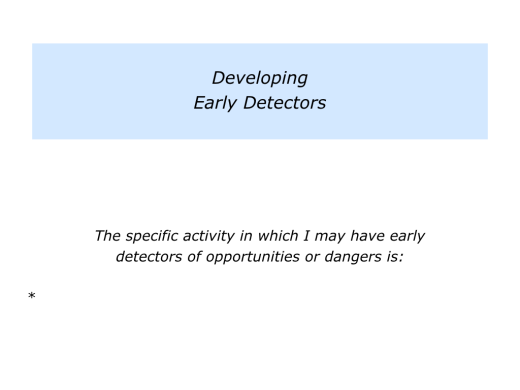 Describe the specific things you can do to make use of these detectors and do your best to shape the future in this activity. Describe the specific things that may happen as a result of taking these steps and doing your best to shape the future in this activity.